Once I was off the bus at Blackmans Bay, the Kookaburras started laughing at me (again like at the beginning of Stage 12). Ha. Ha. Ha. H.H.H. Ha. Ha. Haa. Was this an omen that I was about to do something foolish? My goal for Stage 13 was to walk to Fossil Cove, and then walk another day for a final stage to the mouth of the Derwent River at Pearson’s Point. If you have already read my posting on the 25 February then you know I reached Pearson’s Point. Future postings will give more details about this change of mind and destination. As I turned left from Wells Parade into Hazell St towards the Blackmans Bay Beach, a screech of Sulphur-Crested Cockatoos circled overhead. I was on the beach at 7.45am. 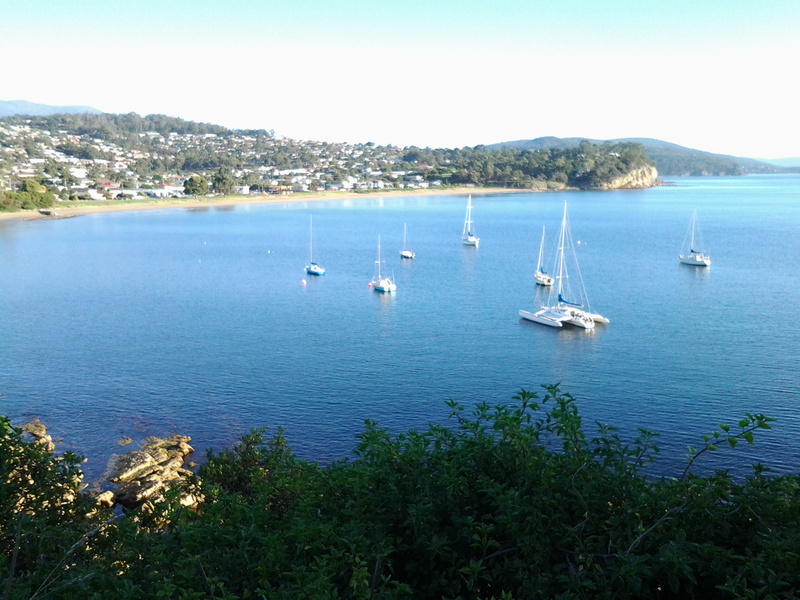 The water was calm and I looked over the Derwent River towards South Arm beach on the eastern shore. The Iron Pot lighthouse on the rocky outcrop just offshore from Cape Direction, on the southern tip of the South Arm peninsula, seemed to stand up from the water like a fat thumb. 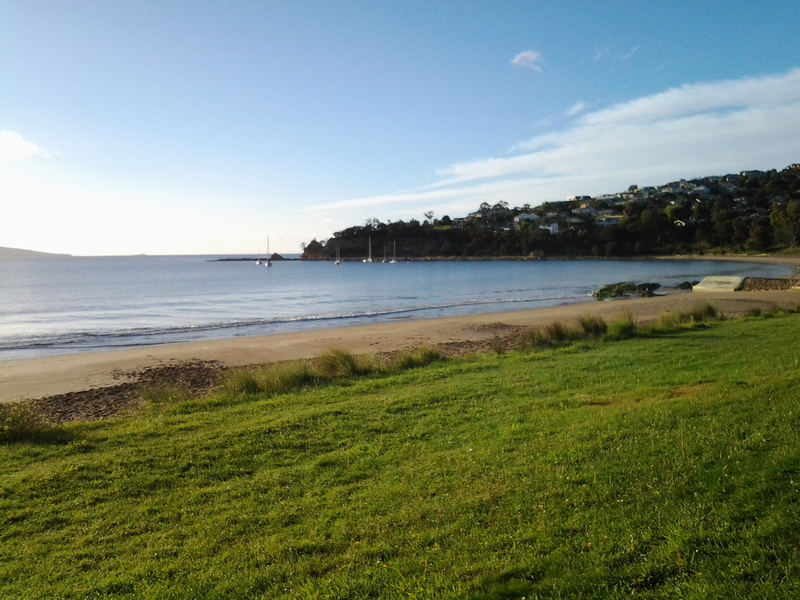 Back at Blackmans Bay Beach, the fresh sunny morning was complete with power walkers and dogs leading their owners on a walk. Public toilets are located half way along the Blackmans Bay Beach. These are the last public toilets for anyone walking further south. How fortunate Tasmanians are to have morning views along beaches such as that at Blackmans Bay. 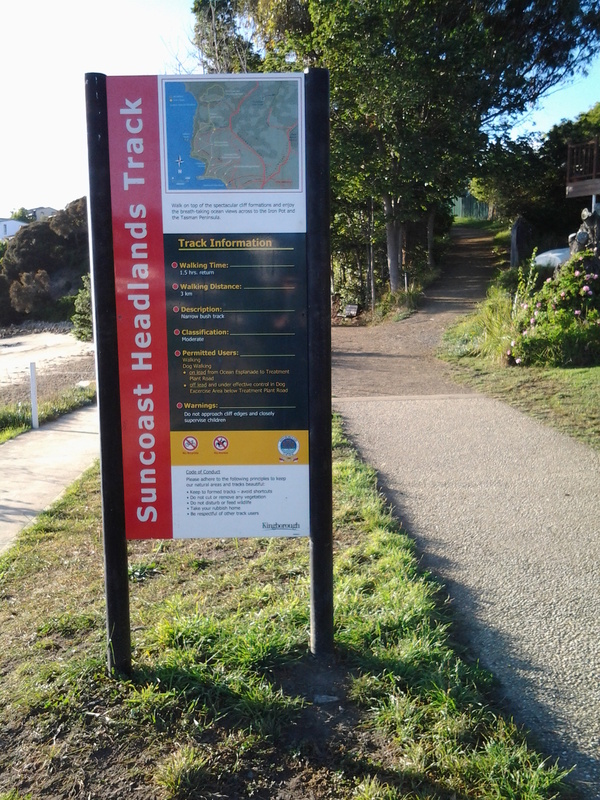 I turned southwards and at 7.51am had reached a tiny yellow sign on a post indicating the Suncoast Headlands Walking Track was ahead. A few minutes later I reached the main sign. This sign was accompanied by another nearby. I followed the good wide dirt track and initially thought how easy it would be for Mums with prams or people in wheelchairs to follow this path. But not so. Not much further along, I needed to climb rough dirt and log stairs and I encountered such interruptions to a smooth walk a number of times. There were occasional splits in the track without signage, so it is possible to walk a little way off the main track before you realise what is happening. How gorgeous the morning was. 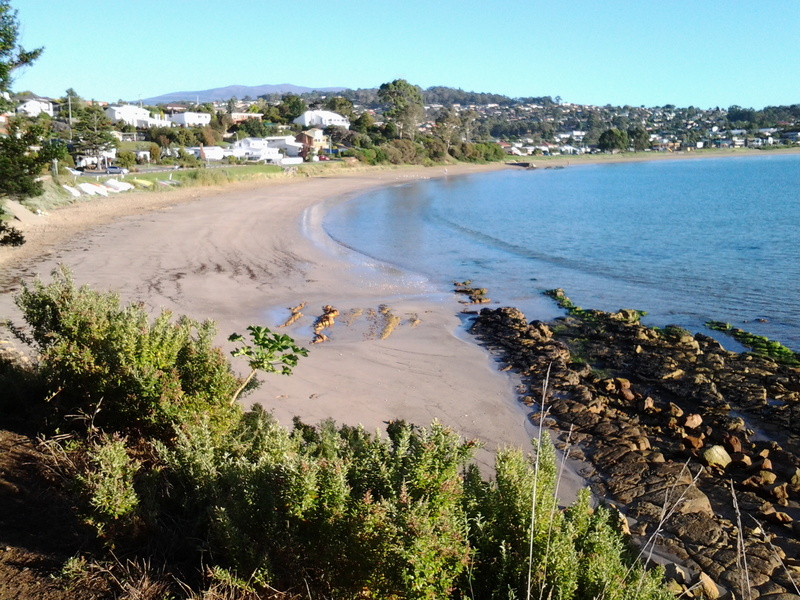 For example, the photo below is looking back to Blackmans Bay Beach. In the photo below, the rocky outcrop at the far end of the beach is where the Blackmans Bay Blowhole is located (my Stage 12 walk there was described in Nudging my way into Blackmans Bay on Stage 12 of my walk along the Derwent River). 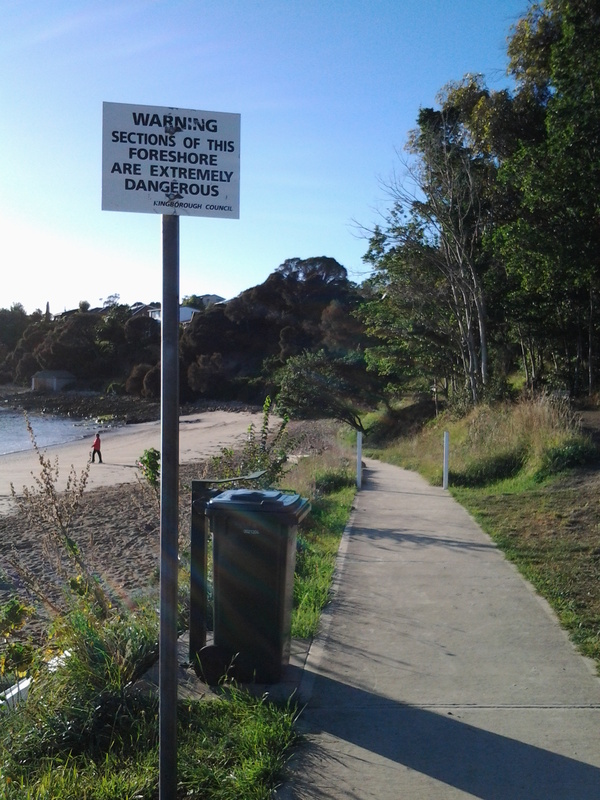 This entry was posted in Derwent River, Hobart, Tasmania, Walking and tagged Blackmans Bay, Blackmans Bay Beach, Cape Direction, Fossil Cove, Hazell St, Iron Pot, Kookaburra, Pearson's Point, South Arm, Sulphur crested cockatoo, Suncoast Headlands Walking Track, Wells Parade on February 27, 2015 by Tasmanian traveller. Beautiful scenery and a challenging walk! But I thought Kookaburras sat under the old gum tree? Laugh! I always feel a little churned up with vague concerns that I will be ‘out of my depth’ on these walks and, in advance I always feel apprehensive and challenged. But with my mantra ‘I only have to take one more step’,nothing is a problem. And looking back after each walk, I always think how easy it was. Well easy is probably not the most accurate word for some situations. I have never had any regrets, and continue to be excited about solving all the unforeseen problems of each next walk. Just as you will once the round Australia trip starts. Looking at that photo in zoom mode, I can see the house of the third family I lived with during my exchange year. I have so many photos looking out over the river from that house, but none from the beach looking up. Thank you for providing a flashback view. How marvellous that I was unknowingly able to take a shot that brought back memories. 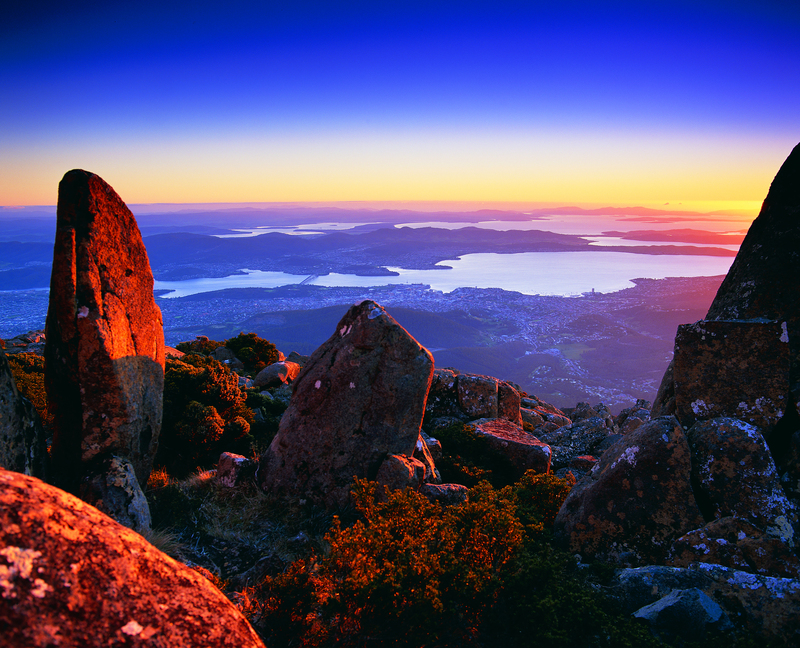 Such photos must be increasing your excitement about travelling to Australia; it must be mounting moment by moment now. Two weeks! In exactly two weeks I’ll be leaving for the airport! And just how many hours, minutes and seconds is that?